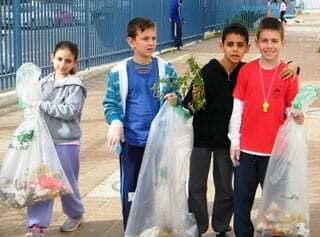 Tons of rubbish were cleared from Israel’s outdoors across the country by children and adults , both Jews and Arabs, who took part in this year’s National Clean-Up Day. It is the 4th year since “National Clean Up Day” bill was passed in 2008, and this year, Clean Up Israel recruited over 70000 volunteers for the flagship campaign. Equipped with bags and work gloves volunteers visited public domains for clean up operations. In addition, there were educational workshops and ceremonies, all aimed as a highlight of year round efforts to raise public awareness to the importance of keeping public areas clean and tidy. Given the rockets attack at the south part of Israel, the country wide activities were split over 2 days to allow the residents of the south to participate, one this week and one the following week. “Clean Up Israel” which is Supported by the Australian Jewish Community encourages physical clean ups and public awareness activities as part of its year round campaigns for cleaner greener Israel. Australian supporters of the campaign include The Erdi Group, James Richardson Duty Free, The Herzog Group, The Besen Family Foundation, Meriton Apartments, the Bruck Group, Moriah College, Reebok, Intertrading Australia, Bunnings and Lonsdale.